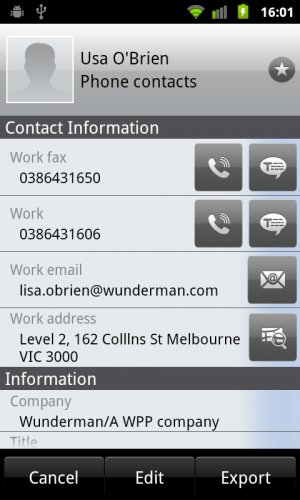 WorldCard Mobile is one of many applications that allows you to scan in a business card and have the details automatically loaded into your contacts. I haven't used one of these kinds of applications in a long time and so I jumped at the chance to test one when a review copy was sent to me. 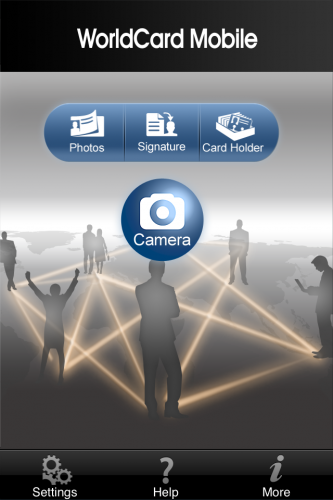 The opening screen is fairly straightforward with the option to start scanning either by taking a picture with the camera or using a photo from your library. There is also an "Exit" button which I disagree with from a UI point of view as that is the point of the physical home button surely? I'm probably being overly harsh as that kind of thing is prohibited by Apple and so I don't come across it much when looking at iOS apps, but I generally frown upon any duplication of standard controls with your own versions (for example, websites that have "back" buttons - that's what the standard browser "back" button is for!) Anyway, I had a business card for one of my friends who works in Australia so I decided to give that a try by using the Camera feature. This loads up a standard camera control and allows you to take your photo. Once captured, you can zoom into the image, rotate it, and choose the correct language from a choice of seven; English, French, German, Italian, Spanish, Portuguese, and Dutch. Pressing the "Recognize" button will then fire up the OCR system that ran in under 1 second on my Nexus S. As you can see, the captured data is incredibly accurate. 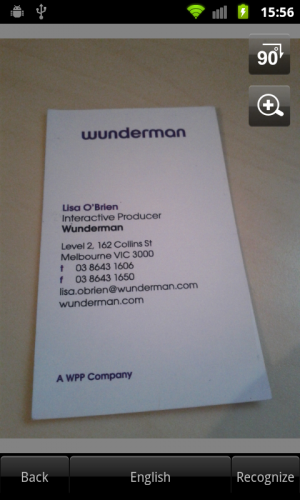 The only problem was with the word "Lisa" which came out as "Usa" but that is partially due to the closeness of the letters on the business card and me not taking a picture close enough. I was particularly impressed with the intelligent way in which it parsed the data enabling it to set the fax numbers correctly as well as building the company name from the logo and footer and correctly picking out the job title. Editing any information that wasn't correct is very easy with a standard editing dialogue. I quickly fixed the name and saved before then pressing the export button. This sends the contact information into your devices address book. As I already had contact information for this person (pulled in automatically from FaceBook), it simply updated the existing record with the new work related information without any prompting. Overall, I'm incredibly impressed with this app and the very fast and accurate OCR software built into it. If you are frequently given business cards, I would highly recommend it as a quick and efficient way of storing them. 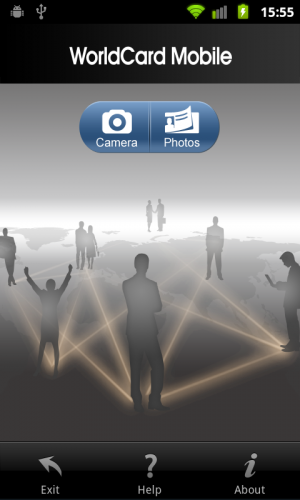 WorldCard Mobile costs $5.99 and is available on the Android MarketPlace. There are other versions available at a higher price for recognising Japanese, Chinese, and Korean text. You can find more details at http://worldcard.penpowerinc.com/ Disclosure: I was given a free copy of this application to review. I tested it on a Nexus S running Android 2.3. If you have an app for iOS or Android that you would like me to review, please contact me. Update: WorldCard were kind enough to give me a review copy of their app for iPhone as well. The interface is pretty much the same with very similar functionality although I did notice that the iPhone version allowed you to review your imported cards within the app (rather than just exporting them to the address book as on Android). However, the recognition quality didn't seem to be as impressive as the Android version with several errors being made compared to the one basic error on the Android app. I'm not sure if this is something to do with the code or with the iPhone hardware (although the tap to focus made me think the iPhone would function better) but for now I'll be using my Nexus S to do any business card recognition.